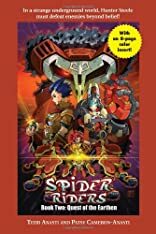 The second book in an exciting new fantasy series for 9-12-year-olds set in the world of Arachnia, located in the center of the earth's core, featuring a young hero and his 10-foot-tall battle spider-the basis for an action-adventure anim� television series to launch in Fall 2006. Hunter Steele never gives up-not when he was living on the surface of the earth and not now that he's fallen into the earth's core, into the realm of the Turandot, a human race locked in never-ending battle with the Insectors, a giant insect-type race. With his 10-foot-tall battle spider, Shadow the Untamed, Hunter has already proved himself worthy of joining the elite force known as the Spider Riders. Their mission: to restore the stolen shards of the Oracle, source of their society's power and protection. BR>But five of the shards are still in the possession of Mantid, a cruel and merciless mastermind. Far from the safety of their plateau city, the Spider Riders must defeat Mantid's allies-Fungus Brain, whose powers of telepathy are greater than their own, and Aqune, a traitorous former Spider Rider who has created her own fearsome force of Mecha-Spiders. Only then can Hunter Steele undertake the final, most dangerous mission alone-to penetrate the heart of Mantid's mighty fortress and prove himself a full-fledged Spider Rider. The Spider Riders book series is the basis of a children's action-adventure anim� TV series currently in production and scheduled to launch in Fall 2006. Produced by Cookie Jar Entertainment, Inc., a leading family entertainment company with properties ranging from Arthur to Caillou and The Doodlebops to Are You Afraid of the Dark? and Dark Oracle, Spider Riders is destined to become as popular as Yu-Gi-Oh! and its predecessors Pok�mon and Teenage Mutant Ninja Turtles.